This article will guide you to extend C drive without data loss when it is running on low disk space on Windows SBS 2003 Server operating system. Download IM-Magic Partition Resizer Server to increase the size of C drive when PC shows low disk space warning on the drive in SBS 2003. Probably, you didn’t think if the size you allocate to each partition is reasonable while building your SBS 2003 Server. Most users realize the problem that some partition especially C partition space is eaten up by Windows updates, temporary files, cookies, etc. If you want to resize disk partition on SBS 2003, you may need to repartition the hard disk which will erase data on the disk. Now, IM-Magic Partition Resizer Server is recommended for all Windows Server users including SBS 2003 Server users to resize disk partition without repartitioning hard disk. Download, install and run IM-Magic Partition Resizer Server. 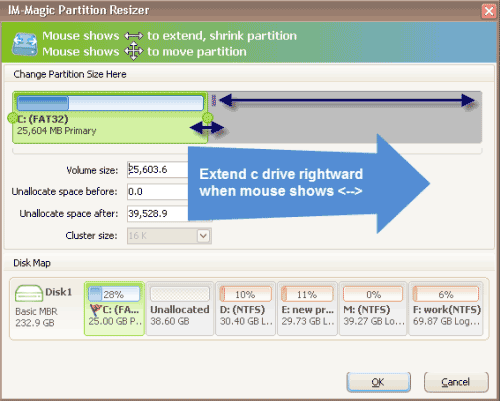 Right click a partition that has lots of free disk space and choose "Resize/Move" option. When mouse shows double arrows, you can move the arrow leftward or rightward to shrink the selected partition. Then, it will produce some free space, which will be shown as unallocated space. Move the unallocated space close to C drive. Right click C drive and choose "Resize/Move" option. Move the arrow when mouse shows double clicks and then click "Apply" button. Windows shows low disk space to give you an alert that the partition is running low on available disk space. You may ignore the warning message if the low disk space is shown on data partition because it doesn’t have any influence on your Server. However, if Windows pops up low disk space warning on C drive, you had better try to find a solution for this problem because C drive has much influence on the performance of your computer with operating system programs installed on it. SBS 2003 is a Server operating system, which is safe and reliable. The best solution to fix low disk space problem on SBS 2003 Server C drive is to increase the size of C drive. Referring to increase size of C drive, you need to reallocate the disk space. Do you think that you need to repartition the hard disk in order to reallocate disk space? As a matter of fact, it can be as easy as possible to reallocate disk space on SBS 2003 by using IM-Magic Partition Resizer Server. IM-Magic Partition Resizer is a partition tool for Windows Server users to manage hard disk in a safe and easy way, so you can rely on this software to resize disk partition on SBS 2003 effectively. How to Shrink a Partition on SBS 2003? Before increasing size of C drive, let us learn how to shrink a partition first of all. Suppose there is more than one partition on your computer, now you need to choose a partition that has large free space. Then you can run IM-Magic Partition Resizer Server to decrease the size of the large partition to produce some free space. The free space will be shown as unallocated volume. 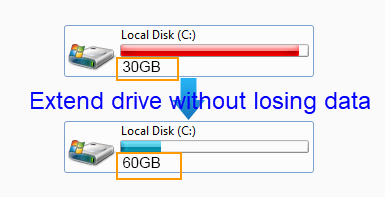 Well, the reason why you need to shrink a partition before increasing C drive size is that some free space is required in order to extend a partition. We have introduced the method to shrink a large partition to squeeze some unallocated space, and then you can move the unallocated space to add it to C drive to get C drive extended. With IM-Magic Partition Resizer Server, it is not necessary to repartition the hard disk to reallocate disk space. Therefore, all data on the hard disk will remain intact on its original place without any modification. In addition, you don’t need to worry if it will have any harm to your SBS 2003 Server by using IM-Magic Partition Resizer Server because this partition software is completely safe and reliable for all Windows Server users. Disk cleanup is Windows built-in tool, which enables users to free up disk space by removing unnecessary files such as temporary Windows files, recycle bin, off-line files, download programs files, temporary Internet files, setup log files, etc. When C drive is running on low disk space on SBS 2003, you can perform disk cleanup to free up some disk space to improve the performance of Server. However, the disk cleanup tool cannot solve the low disk space issue thoroughly because it is only able to free up little disk space. If you use IM-Magic Partition Resizer Server, you don’t need to perform disk cleanup, instead, you can increase size of C drive as you wish.